Make Tracks to the WSA this Archives Month! October is Archives Month, the time when archival institutions around the country make a special effort to promote the important work archives do in preserving and providing access to America’s documentary heritage. We are pleased to kick the month off by launching our new website later this week. The new design has been many months in the making and its goal is to provide users easier access to information about the State Archives, the services we provide, and our collections. We are very excited about the changes and I hope you will visit the site and let us know what you think. We will join archivists from around the country on Twitter October 4 for #AskAnArchivist. I encourage everyone to jump on Twitter and ask us any of those lingering, burning, nagging Archives questions. October 10 is Electronic Records Day (#ERecsDay), so watch this space for an update on what the State Archives is doing to help state agencies and political subdivisions manage and preserve their electronic records. We will also pass along some good information on preserving electronic records from the Council of State Archivists. Rick Ewig, a historian who has recently retired after a distinguished career as an archivist at the State Archives and the American Heritage Center, will be the State Museum’s fall lecture series speaker in October. Rick’s presentation titled, “Settling the Sterile and Desolate Plains: The Founding of Cheyenne and Then Some” is at 7pm, October 12, at the Wyoming State Museum. Rick published a book about the history of Cheyenne this summer. In researching the book, Rick used documents and photographs from several archives in the area, including the State Archives. Our Archives Month activities always remind me what a privilege it is to be the Wyoming State Archivist. The staff, the collections, and our constituents make the job so rewarding. The State Archives provides valuable records management and imaging services to state agencies and political subdivisions. Our archival collections are a treasure trove for genealogists and historians and they help people resolve issues that come up in their daily lives. From photographs and historic documents to school transcripts and court records, the documentary heritage we preserve is incredibly diverse and important. And with that, make tracks to the Archives and help us celebrate Archives Month! Do you create documents on your computer? Your tablet? Do you write texts and posts on your cell phone? Then you are creating electronic records. Think of all the files you create in a week or a year. Then, imagine how many such documents are created by Wyoming state employees in the same amount of time… Where are they all kept? How do we know that we will be able to read and have access to them in the future? These are the knotty problems that your State Archives staff wrestle with every day. We are participating in Electronic Records Day 10.10.16 this year by telling you about how we are solving those problems via the Wyoming Digital Archives, our system for preserving digital files created in the conduct of state business. Why do electronic records need special attention? With the increasing reliance on information technology, the challenge to manage, preserve, and provide access to digital records and information continues to grow. Action must to taken to ensure future access to electronic records. Paper records stored in good conditions can be read centuries afterwards. Typical electronic file formats have a life span measured in decades at best. Rapidly changing software and hardware environments can leave electronic records virtually inaccessible after just a few years if not monitored. Electronic records require proactive management. The best time to plan for electronic records preservation is at the time records are created, rather than when software is being replaced or a project is ending. State Archivist, Mike Strom, says he is most happy that the Wyoming Digital Archives shows how the state of Wyoming is involved in e-records in a substantial way. He says it is good to work with agencies to manage records so that they’re kept the right amount of time, according to our records retention schedules. The State Archives is already working with fourteen state agencies that are entering their records into the Digital Archives – which contains over 300,000 individual records so far. Strom’s goals for the future include seeing that all state agencies are engaged in some way with this project. A broader goal is ensuring the long-term preservation and accessibility of all of the state’s records regardless of their format. Can the public see these records, too? Yes, the Digital Archives has a public access feature so that records which you might be able to see by contacting a state agency (like incorporation or other state reports) will be accessible through a portal on the State Archives’ web page or by a link to that portal from the state agency’s website. 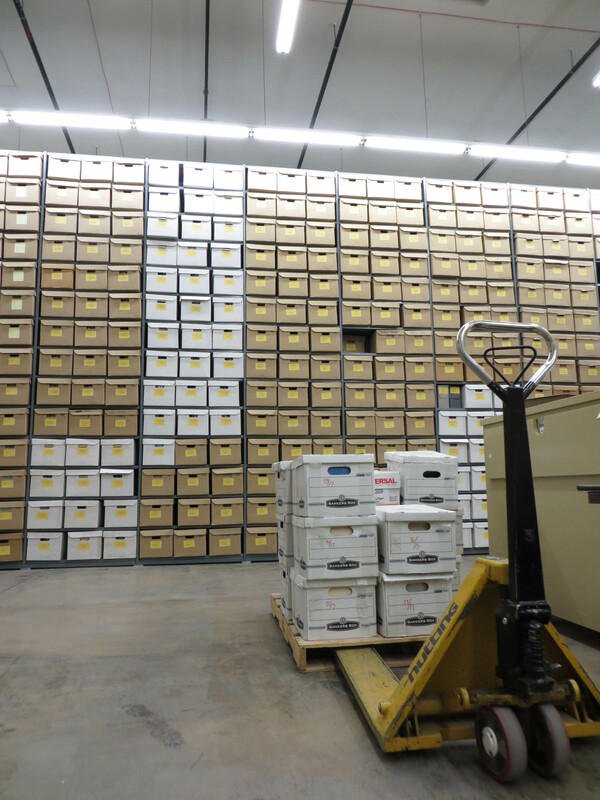 The State Archives operates a Records Center which has rows and rows of boxes, shelved fourteen levels high and served by staff with forklifts. The Wyoming Digital Archives will soon house the same amount of records, but we won’t need a forklift to find the right box or file. We will use online searching to find the information that agencies need to conduct their business – and that you, the public, need to find a court file or school transcript, write a research paper, or dig into your family history. Still wondering what to do with your own personal digital files? Here are some great tips from COSA. 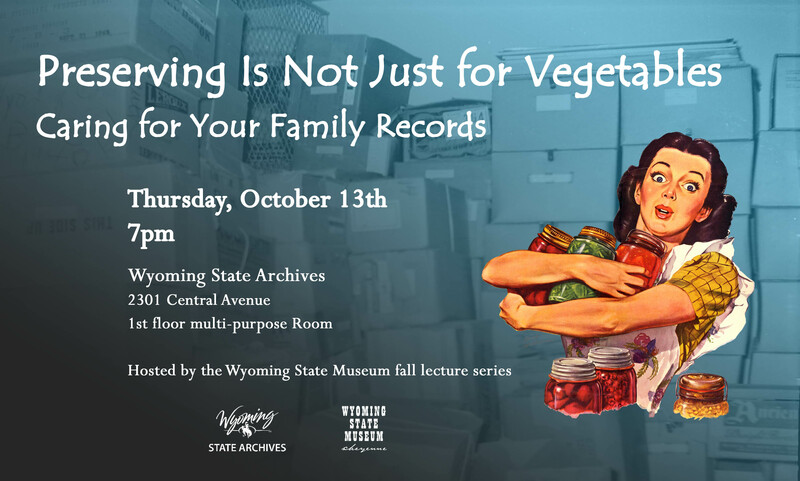 We also hope you join the staff of the State Archives this Thursday, October 13th as we present recommendations on how best to store and preserve all types of family records, including electronic records. What is so special about 10/10? Well it looks a lot like 1010 (or 10 in binary). But mostly its special because today is Electronic Records Day! On the off chance you hadn’t noticed, our world is becoming increasingly more digital, and this includes the records and documents we all create in the course of our day. As we lead more of our lives online, rather than on paper, the historical record itself is seeing a shift in format. Stacks of personal letters are giving way to emails, texts and tweets. Boxes of negatives and prints are transforming into stacks of CD, SD cards, external drives, and seemingly endless folders of digital photos on our computers, phones and in our “clouds”. Tax records, bank statements, school report cards, and even utility bills are all available online now as companies push cost- and clutter-saving “paperless” programs. But regardless of format, the question remains: what do you keep, for how long and how do you ensure its survival. The Council of State Archivists (CoSA) and archives around the country are joining together to raise awareness of the importance of caring for your digital records. As with your traditional paper documents, not all digital records are worth their bytes. And just because you can find it using a search bar does not mean that it is easily accessible. Would your family know where to start looking for the important stuff or would they have to wade through TBs of junk? This also means that the “historical” records of to day will most likely take up more bytes than shelf space, so the more we learn now about proper electronic records management, the better prepared we will all be to care for this brave new world of historical documents. More information about 2015 Electronic Records Day from CoSA.